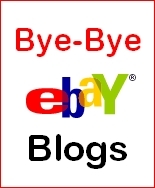 After years of providing sellers and other interested parties with space to blog about products, services, or whatever was on their minds, eBay has decided to discontinue the blogging platform hosted by their company, effective Otober 31, 2009. Bloggers and sellers are quickly weighing in on this change, mostly with criticisms about eBay’s decision and their beliefs that the firm cares more about making money than making space for random content. I first learned about eBay’s blogging platform through a 2007 article published in Entrepreneur Magazine. The story explained how anyone could set up a blog, free of charge, to promote their business and gain traffic from eBay’s network. The idea of routing a piece of eBay’s massive traffic my way, even if I wasn’t involved in auction selling, was enough to convince me to start a blog in addition to maintaining my self-hosted blogs. My statistics proved eBay’s ability to generate a decent amount of traffic without any self promotion, and though I don’t know how many sales resulted from it, my posts were consistent in exploring the topic and providing relevant reasons to visit my sites. In its farewell message, eBay encourages bloggers to “…print out or save your blog entries before we close this section of our site.” eBay’s blog discontinuation may not directly impact your business, but it does bring up a valuable lesson in treating your intellectual property as a premium commodity and vital part of business growth. What would happen if the blogging platform you’ve chosen, whether hosted by Blogger, WordPress.com, or self hosted, disappeared without warning and you had no back-up program in place to capture posts? How would you replace all the years of expertise shared with readers who follow, comment, and recommend your firm? That made saving the content easy, so there’s no need for me to copy every article written since 2007 before it’s deleted. What’s your plan for maintaining a record of your online property, or have you yet to put this procedure in place? Your company can grow without changing your address. Office rental Toronto location that’s like a home office!